A N G L A N D I C U S: Aoibhinn beatha an scoláire - Sweet is the scholar's life! Aoibhinn beatha an scoláire - Sweet is the scholar's life! The Scholar's Life (Beatha an Scoláire) is a seventeenth century Irish poem that describes the life of leisure and privilege enjoyed by the scholars of Ireland. I'm not sure where exactly this particular Irish scholar was studying, but it sounds very relaxed! Apparently in seventeenth century Ireland, school days were indeed the best days of your life! Here is Thomas Kinsella's translation. is a fistful of pens. 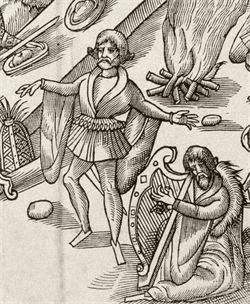 Seán Ó Tuama and Thomas Kinsella, eds. Duanaire, 1600-1900: Poems of the Dispossessed (Dublin: Foras na Gaelige, 1981), 16-17. I think you may have a moral obligation to share more of your thoughts in writing. Hi James, thanks for the encouragement! :-) I read your blogpost. Very good. I am from Ennis, Co. Clare, Ireland.